1. That Andy Richter is back with Conan O'Brien as he begins hosting The Tonight Show is fantastic. I miss the old days and was very glad to see them do a new version of "In the Year 2000," retitled as (you guessed it) "In the Year 3000." I was laughing so hard I was crying, and a little weepy too at the prospect of both guy being back together. If you haven't seen Conan yet, he's quite good and not "Late Night" Conan. He's prepared to take on the middle-aged people that used to watch Leno, who, of course, is much less funny than Conan. 2. 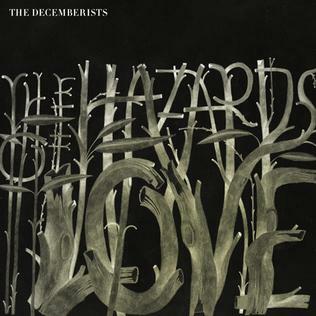 If you're so inclined, pick up or download (which you can do legally) The Decemberists' new album, The Hazards of Love. It's a concept album, but more than that, it's really goddamn good. It's a bit rough in patches in terms of theme, but if that bothers you, I'm not sure how to help you. Like all concept albums, there are songs that have been hammered into the round hole, but the more I listen to the songs, the more I feel like they are together. 3. Moving preparations are coming along. I'm so excited about starting school that I can hardly express it in any available form.